Ageing and dependency: which economic model should we opt for? 11 March 2011 - The Caisse des Dépôts et Consignations, the Regional Council and Autonom’Lab invite national and European stakeholders to attend this event in Limoges. The conference will focus on projects and policies initiated in Limousin – a French region leading an active policy towards ageing population. The conference will start with an overview of regional innovative strategies for elderly people (health services, self-health management). One shall seek to answer the following questions: does the current economic model effectively respond to elderly people needs? Should we instead think of another economic model? Henry Nogues (Professor of Economics at the University of Nantes), Michèle Debonneuil (President of the ANSP Scientific Committee – the National Agency for Supportive Services and Care) and Didier Duplan (Assistant Director of the charity network ADESSADOMICILE) will make a series of presentations to launch the debate. They will analyse the main problems that are encountered by elderly service providers. Two round-tables will take place in the afternoon. The first one will deal with economic models induced by key actors at local level. The second one will present initiatives and experimental tools that are both economically efficient and adapted to the needs of elderly people. Stéphane Soyez (Director of Autonom’Lab) and Michel Laforcade (Director of the Regional Health Agency -ARS) will close the debate. 8 March 2011 - The eris@ conference 2011 in Krakow will be a different format to previous years. Not only is there a pent up demand to help practitioners accelerate the implementation of major programmes but also, with the World and European economies just emerging from recession, it is essential that we concentrate more of our resources on impact and results. In previous years the conference format has focused typically on presentations of future trends in technology and associated legislation; Krakow 2011 will concentrate on workshops defining current and future state but also crucially how we bridge the gap to achieve impact which will improve the quality of lives of citizens. The programme will therefore be focused on imparting skills to help move regional resources from the relatively safe environment of policy development to implementation and practice where risk is the norm. 30 July 2010 - Fundecyt and the Junta de Extremadura (regional government of Extremadura) together with the European Commission - DG Employment, Social Affairs and Equal Opportunities, the Committee of the Regions, the Ministry of Health, Equalities, Care and Ageing (North Rhine-Westphalia) and the "Silver Economy Network of European Regions (SEN@ER)" (www.silvereconomy-europe.org) - would like to invite interested stakeholders to the "Regional Strategies on Active Ageing" workshop. The workshop will take place in EU representation of North Rhine-Westphalia, Rue Montoyer 47 in 1000 Brussels on 23 September 2010, 13:30 - 18:00 h.
Against the background of the upcoming European Year for Active Ageing & Intergenerational Solidarity 2012 the workshop aims at the development of a European exchange of information on activities and initiatives in different European regions, the identification of areas for cooperation which may lead to the establishment of partner consortia and the development and submission of project proposals to European Commission funding programmes. Click here for the workshop website and the online registration. The SEN@ER workshop "Skills development and life-long learning for older people" will take place in Düsseldorf, 15 September 2010, 13:00 - 18:00 h at the Ministry of Health, Equalities, Care and Ageing, Horionplatz 1 in 40213 Düsseldorf, Room 444. 16 June 2010 - As part of an expert roundtable on "European models on active ageing policy" at this international event with around 800 delegates Sébastien Proeschel from the Conseil Régional Limousin and the SEN@ER partner region Limousin presented the active policy of the Limousin region and Werner B. Korte from the European SEN@ER Secretariat - on behalf of Claus Eppe from the Ministry of Health, Equalities, Care and Ageing of the State of North Rhine-Westphalia - the "Seniorenwirtschaft NRW" initiative which already started in 2000. Both also presented to the several hundred conference participants the Silver Economy Network of European Regions which found substantial interest among the audience. The "Silver Economy Network of European Regions (SEN@ER)" (www.silvereconomy-europe.org) - cooperation workshop on "Ageing Well at Home" will take place on 23 June 2010 from 13:00 - 17:00 h at the Ministry of Health, Equalities, Care and Ageing in Düsseldorf, Germany. Bonn, 21 March 2010 - The Silver Economy Summit was held on May 13-14, 2010 at the World Trade and Convention Centre in Halifax, Nova Scotia, Canada. The summit was a great success and also attended by the minister of seniors in Nova Scotia, Canada. It was well attended with 250 delegates, many of which international delegates. The focus was on continuous education, work and employment etc. for seniors. The organisers explicitly thanked SEN@ER for their assistance and mentioned SEN@ER as a shining example for constructively and positively addressing the issue of demographic change and ageing which they have taken over and copied for Canada. The SEN@ER network was presented by Paula Fitzsimons from the partner region Mid-East Ireland Region who also presented the most recent SEN@ER initiative "Senior Enterprise". Bonn, 21 March 2010 - The 12th issue of the the newsletter has been published today. It provides the information in html format with links to further information an contacts. Amongst other - the latest version describes the recently started new European projects Senior Enterprise, INDEPENDENT and eSESH in which partners from SEN@ER regions are involved and informs about results and achievements of the AAMEE and CULTUREMAP projects. The newsletter is available for download in the 'newsletter' section. The fourth European "Silver Economy in Europe" attracted more than 200 participants from all over Europe to Limoges (France). The event followed the successful European Silver Economy conferences in Bonn (Germany) in 2005, Maastricht (Netherlands) 2006 and Sevilla (Spain) 2007. It was hosted by the SEN@ER partner Conseil Régional Limousin from 28 - 29 January 2010. The conference included a roundtable on "Regional silver economy and ageing strategies - examples and lessons learned" with experts from different European regions and a series of parallel workshops followed by site visits and a public debate on the second day which took place in the Hotel de Région. As part of a Silver Economy Good Practice Competition three applications received a good practice award which was awarded by Jean-Paul Denanot, the Président du conseil régional du Limousin. In the category A 'Strategies for ageing in the area of employment and voluntary work' the award went to the University of Strathclyde, Senior Studies Institute, Glasgow (Scotland) for their "Realising Your Potential (RYP) Project". The category B 'Ageing well and wellbeing" price was awarded to the Caisse Primaire d'Assurance Maladie de la Creuse (CPAM) with their "Des Ateliers Equilibre à un programme évolutif de prise en charge globale du bien vieillir". The category C 'Local strategies for independent living' winner comes from Sweden and is the Blekinge Institute of Technology with its 'SeniorForum'. 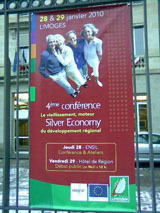 The 2010 Silver Economy Summit will challenge conventional attitudes toward aging. The aging population has far-reaching implications for our economy and society... matched by positive opportunities. At the 2010 Silver Economy Summit in May 2010 in Halifax there is the possibility to meet people who are adapting and thriving within the Silver Economy. The 2010 Silver Economy Summit will be the first event of its kind in North America. The Silver Economy Summit will gather international, national and provincial perspectives on the economic and societal changes that arise from an aging population. Join 350 Summit delegates from a wide variety of social and economic sectors. Make connections, and share opportunities and information that will help your organization further your mandate and interests in today's and tomorrow's Silver Economy. Use the e-mail submit form to register for event updates. After the successful European Silver Economy conferences in Bonn (Germany) in 2005, Maastricht (Netherlands) 2006 and Sevilla (Spain) 2007, the 2010 conference will be hosted by the SEN@ER partner Conseil Régional Limousin from 28 – 29 January 2010 in Limoges. WS3: "Local strategies for independent living"
The Good Practice Competition is also now open and interested parties are asked to submit their applications online. Bonn, 07 July 2009 - In a recent Communication on "Dealing with the impact of ageing population in the EU (2009 Ageing Report)" of 29 April 2009 the European Commission explicitly refers to SEN@ER where European regions work together to promote the development and marketing of innovative products and services aimed at older consumers. The European Commission Communication takes an in-depth look at the economic and budgetary impact of an ageing population over the long-term until 2060 and calls for a renewed strategy to tackle Europe's demographic challenge. It clearly states that governments have a window of opportunity before the baby-boom generation retires to tackle the challenge. But the policy measures taken must be compatible with the need to support the economy at this juncture, as recommended in the December European Economic Recovery Plan. Ageing will already start affecting most EU economies in the coming decade. SEN@ER partners have been successful with a bid for an EU service contract and have started a project on "CULTUREMAP - Study on the mapping and evaluating of existing platforms (websites) within the cultural sector aimed at stimulating debate and cross border exchange of matters concerning European culture"
The objective of this project are to map and analyse existing websites in Europe which are used as a means for exchange of information and debate on culture, artistic expression and as a space for an exchange of opinions on the European project, with a view to proposing recommendations on how to enhance the use of the internet as a means of information exchange and debate at the European level on cross-sector issues in the field of culture and artistic expression. Bonn, 07 July 2009 - The proposal submitted is a CIP ICT PSP Pilot Type B proposal addressed to ICT PSP Objective identifier: 1.3 ICT for ageing well / independent living. The SEN@ER partner involvement includes Unitary Authority, Kingston upon Hull City Council and University of Hull, Institute of TeleHealth and Tunstall Healthcare (UK) Limited from Yorkshire and empirica from NRW.